Did they change the pipes running into Madison Square Garden this season? There's certainly something in the water. 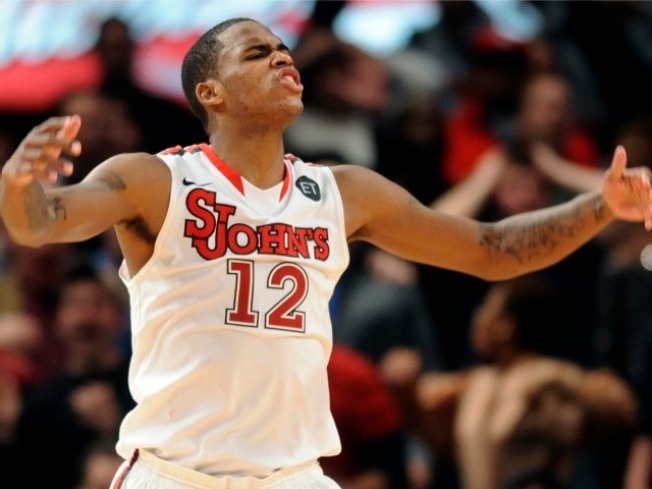 The Knicks are 19-14 after years of wandering in the desert and now St. John's is making noise in the Big East. They beat Georgetown in a 61-58 thriller Monday night when Justin Brownlee followed a Dwight Hardy miss for a putback with 10 seconds to play. It was a rare miss for Hardy, who finished with 20 points by employing the classic New York point guard skill of making the guy in front of you look foolish all night long. On the play that led to victory, he juked Eric Freeman of the Hoyas so severely that Bill Raftery broke out the classic "lingerie" line to illustrate the way he left his underthings behind. The nationally televised win over the nation's 13th ranked team will certainly have people talking up the Red Storm, but it didn't come out of nowhere. They're 3-0 in the Big East right now, with their first two wins coming on the road against West Virginia and Providence. They also won the Great Alaska Shootout and at Arizona State, a resume that has helped them to the 10th best RPI in the country and an 11th seed in the latest tournament projection by ESPN bracketologist Joe Lunardi. Bracketology may be the fastest-growing science in the world, but we understand if you're still skeptical. We've seen green shoots from Queens in the past, only to have them wilt and die over the course of a long Big East season. The conference is no easier to navigate this year, which means the next seven games are all against Top 25 teams. A scary thought when you realize that the Red Storm did lose to Fordham and St. Bonaventure earlier this year. But just as we aren't asking for the Knicks to knock of the Celtics or Heat just yet, we aren't expecting Steve Lavin to cut down any nets in his first season. More modest goals are in mind. Let's start with getting some cameras to watch the team watch the brackets being unveiled on Selection Sunday and then go from there. A modest goal, perhaps, but winning traditions in Jamaica weren't built in a day.